Description: Super-rare Slide Hampton album (originally released by Pathe - EMI in France) meticulously reproduced and lovingly reissued by Atelier Sawano of Japan! High qulaity vinyl pressed in France! This is a jazz album we don't see everyday! Trombonist Slide Hampton was living in Europe since 1968, staying there after a tour with the Woody Herman band. It is unclear how this album came to be, but the people at Pathe, a French label, put him together with another American expat, legendary drummer Philly Joe Jones, young rising-star bassist from Denmark Niels-Henning Orsted Pedersen, and free-leaning German pianist Joachim Kuhn. This group of phenomenal musicians -- apparently formed just for this recording -- created an interesting chemical combustion because of their stylistic differences: Hampton and Jones more mainstream and Kuhn more avant-garde. The key here is probably Kuhn's passionate, aggressive playing which inspired the others to a higher level of intensity. It takes a certain amount of courage for a trombonist to record a one-horn quartet album, and Hampton proved he was one of the elite players who could pull it off with a convinsing result. He shows his respect for another great, J.J. Johnson, by playing his composition "Lament." 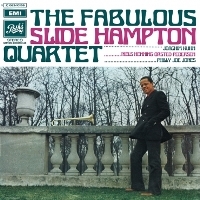 A true collector's item and a must-have for fans of Slide Hampton! Recorded in Paris on January 6, 1969.